In the Civil-Military Liaison conference between the officers of Government of Himachal Pradesh and Western Command held at Shimla today, Chief Minister Virbhadra Singh revealed that a Joint Committee of State Government officials and officers of the Indian Army would be constituted to monitor the progress of pending issues between the State and Army Authorities once in a month. Virbhadra Singh said that Army, Civil Administration, Para Military Forces and Police were important pillars of democratic society and co-ordination between them was must to ensure internal as well as external security of the Nation. He said the liaison between them even becomes more important to mitigate manmade and natural disasters. 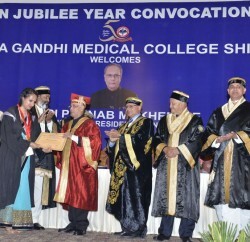 He said that protection from flash floods and cloud bursts which cause vast devastation and loss to public and private property and to infrastructure like roads and bridges required urgent response and the Army had been providing timely assistance to the State Government during natural disasters and the efforts of army in rescue operation and restoration were commendable, he added. Chief Minister said that State Government would provide all possible help to the Army and re-enforce the existing ties. He said that in Jammu & Kashmir, cross border terrorism and overall internal security was under control, however, Himachal Pradesh share its border with Jammu & Kashmir on one side and international border with China on the other, hence it becomes imperative to maintain vigil. 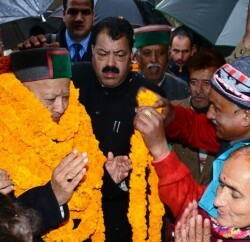 Virbhadra Singh said that Himachal Pradesh had been contributing substantially to the armed forces of the country. He said that at present there were 1,20,600 serving soldiers, 1,04,896 ex-servicemen, 1074 war widows and 28,667 other widows and we are committed to the welfare of both serving and retired soldiers and their families as well. Social Justice & Empowerment and Sainik Welfare Minister Col. (Retd.) Dr. Dhani Ram Shandil while welcoming the Chief Minister said that he had been a soldier himself and was well aware of the problems being faced by the soldiers, ex-servicemen and their families. He said that State had a rich legacy in serving Indian Army and was proud of all its serving soldiers and ex-servicemen who have won laurels in the battles and brought honour to the State and the country. Lt. General Sanjiv Chachra, GOC-in-C, Western Command praised that State Government for being considerate and generous to the needs of the Defence Force. He said that a large number of officers and soldiers from Himachal Pradesh were serving the defence forces and their acts of valour have saved the Nation many times. He requested the State Government to expedite early settlement of many on going issues, especially related to land. He thanked the Chief Minister for quick response to the Annandale issue and requested him to consider for leasing the Annandale Ground to the Army for longer duration. He assured that Army would provide all assistance to the State Government. He urged the State Government to provide better job opportunities to the ex-servicemen so that they could be settled in a better way. He also requested for allotting land at Una so that a model military station could be developed there. He also expressed hope that other pending issues would be sorted out with the Government at the earliest. Chief Secretary S. Roy, Additional Chief Secretaries P. Mitra and Ajay Mittal, Principal Secretaries, Secretaries of State Government and senior military officers were also present on the occasion.